Veebeam does not do anything new. There are a variety of ways to get content from your computer to your TV. But the Veebeam does it easily. Web? Games? Movies? Hulu? With a Wireless USB dongle and receiver, you're set. 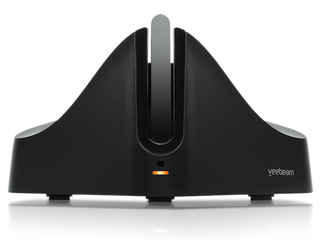 By plugging the $99 Veebeam's antenna into your computer's USB port, whatever is on your screen is shot over to your TV via composite or HDMI-connected receiver. Simply as that. No cords and no software. The cleverness here is that you don't need to worry about the permission of content providers to watch whatever online content you want on your TV. Hulu? Bring it on. ABC streaming episodes? Sure. If you can play it on your laptop or view it in your browser, it's all gravy.